Continuing on with the work in the staging, it would appear as if the crews are working around the clock (hope the union doesn’t catch wind of that). Those straight sections I mentioned in the part 3, well they are done, and more. The entire West ladder is complete, including the re-railers. 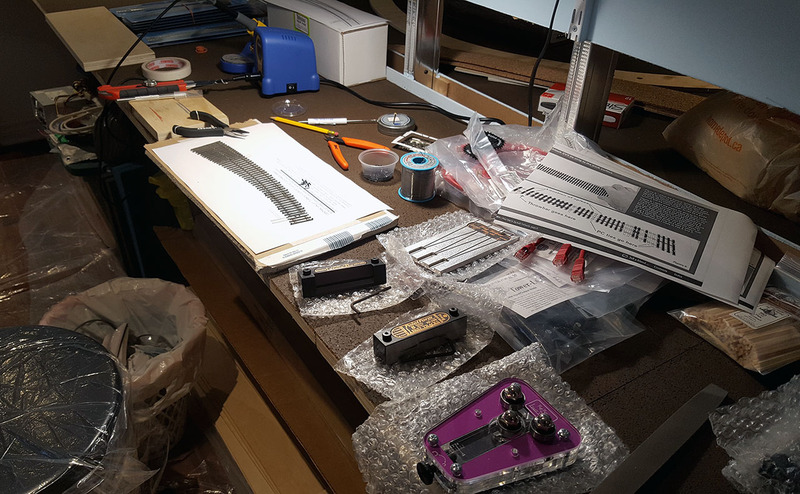 Originally I wasn’t going to touch the handmade turnouts but after putting the PCB ties on, they stuck out like a sore. So, I decided to do a quick coat of Rust-oleum Camouflage Earth Brown…a comparison photo below. Oh boy, I really feel I’m on the roll. Either that, or the desire to get the straight sections of the yard over and done with. Did I mention boring, tedious and repetitive? Work continues in the staging with the MoW crew busy test-fitting the West ladder of the main yard. Turnouts are so much more fun as things can always go wrong. 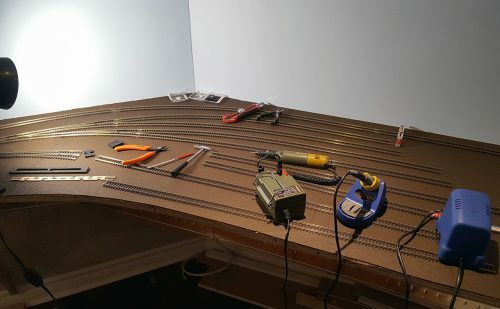 Straight track is just that – straight, but for turnouts you need to drill holes for the motor, feeders, etc. 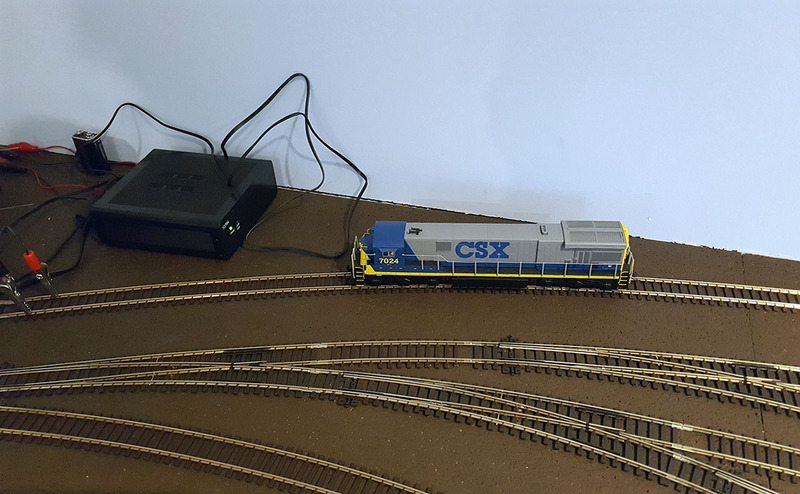 The room being only 12 ft. wide is pretty tight on curves, so to turn around corners I used custom turnouts in designing the staging yard. Seemed like a good idea at the time thought it meant I had to hand make turnouts. 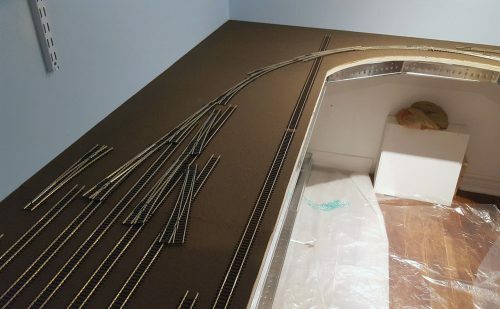 A sane person starting on a big layout for the very first time, without any experience hand laying track, would choose to maybe make one custom turnout – a straight one, for shits and giggles. 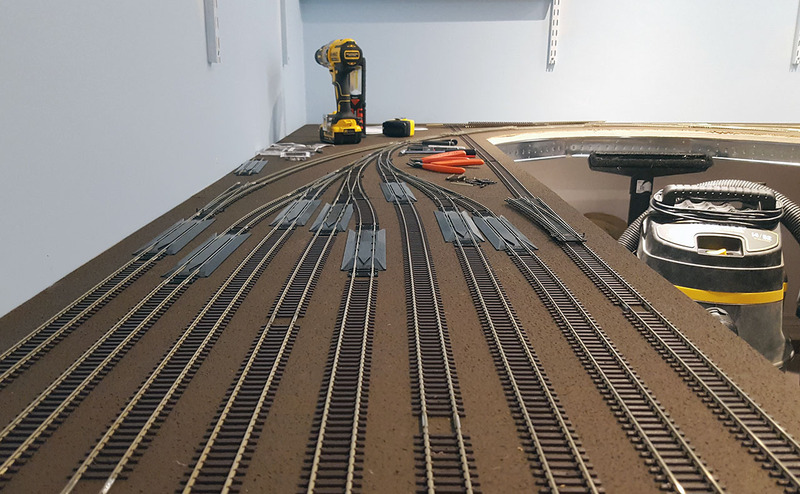 I dived into making 5…curved…turnouts, all having both curved point rails and curved frogs. Let’s go! I couldn’t resist to test the so far laid track, so I jury-rigged a Roco booster with some alligator clips to the track and voila – we got power! I’m really not sure why it took me this long to start laying track down in the yard. 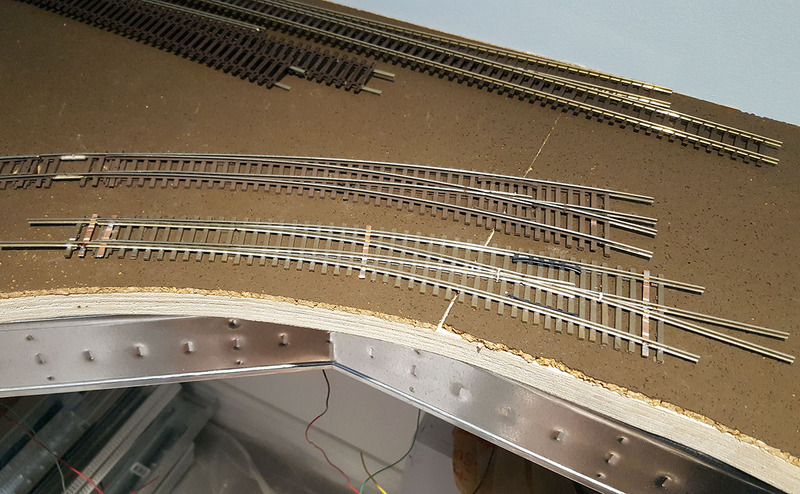 I suppose I had my doubts about whether the main staging yard should remain split in half, with a double ladder in the middle, or have one long yard and park trains one after the other. 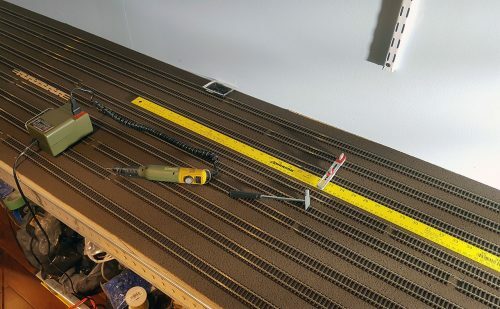 After that was put to rest (and I opted for a single long yard), I gathered my tools and started on a bit of this and a bit of that.